Box no. 12 marks the halfway point of 24 Boxes. So far, so good. I’ve had a lot of fun preparing posts and recipes. Last week, Blogger featured us on their “Blogs of Note” list which garnered a surprising amount of hits and a lot of new readers. The constant rain that we’ve been experiencing in the Chicagoland area has taken it’s toll on some of the crops at the farm. The average rainfall in Rockford, Illinois during the month of August is 4.21 inches; August 2007 dropped a total of 13.65 inches of rain! But that’s part of subscribing to a Community Supported Agriculture program – you have to take the good with the bad. Overall, Angelic Organics is predicting a good fall and winter share of potatoes, winter squash, fall brassicas, sweet potatoes, popcorn and beets. But for now, we’re still enjoying the fruits of summer – tomatoes, melons, carrots and basil – and looking forward to some dryer weather so the crops (and the farmers) can recover. Click here to download a pdf of the Angelic Organics Farm News for box no. 12.
our problem here in the sunny south is that we have not enough rainfall and temperatures exceeding 100 degrees all summer long. I am very disappointed in my garden this year, but my local farmer's market has been great! I don't know where they are getting produce from, but they have the most delicious tomatoes, peppers, onions,grapes, and cucumbers that I have ever tasted! I am really thankful for my local farmer's market. Bob and Lisa's located in Powdersville, SC on Hwy 81. Hi I am really into cooking and I picked out some recipes thanks a lot they are really nice I can say now what do you want to eat insted of saying do you want beans on toast or not? love your blog, the pictures, the words, everything. i completely agree about seeing well designed cookbooks... make your moth water, specially the deserts.. I am so excited to report that we're joining a CSA ourselves! We found out our neighbors across the street is a drop of point for Terra Firma Farms. Hooray! I can't wait to get our own boxes rolling in. About thirteen years ago, an old lady who lived across the road from me died and she left me a few boxes of things to pass it on to the right people. In it, there were some very old cook books. Everytime I find a collector of vintage cook books - I don't find many - I donate one of the books. Let me know if you would be interested in one of Mrs Williams books. This is a very useful blog. I have added it to my favourites. Hi Fussy Eater. I would be honored to have one of Mrs. Williams's books in my collection. Please send me an email to jnoelle.cooks@gmail.com and we can go from there. Thanks! I have added your blog as one of my favs. I also love cooking. For me the thrill is not just the end result, but also the treatment of ingredients, the understanding of which grows with each time you handle them. Hi - I found your blog when looking at the "blogs of note" a couple of weeks ago. 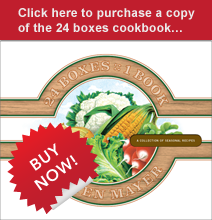 "24 Boxes" intrigued me...I was pleasantly surprise to discover the subject - using all the CSA veggies in the weekly box! I instantly bookmarked the page. I joined a CSA for the first time this year - Pleasant Ridge Produce, near Richland Center, Wisconsin. It has been a lot of fun to get that box of veggies each week...kind of like a "surprise package". I have struggled to come up with recipes for everything. Like you, I feel guilty if something is wasted. Your recipes sound great, especially the veggie burger you just posted. Unfortunately, I don't think I will get beets in my box this week. Like you, our area of the state was hard hit with flooding, which may end up cutting the season short. Thanks so much for creating such a useful and enjoyable blog.